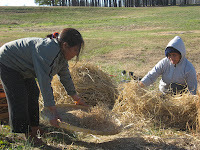 When foodies, locavores and regionalists talk about sustainability or support for local farmers, craftsmen and business people, they almost always leave out refugees, immigrants and ethnic enterprises. 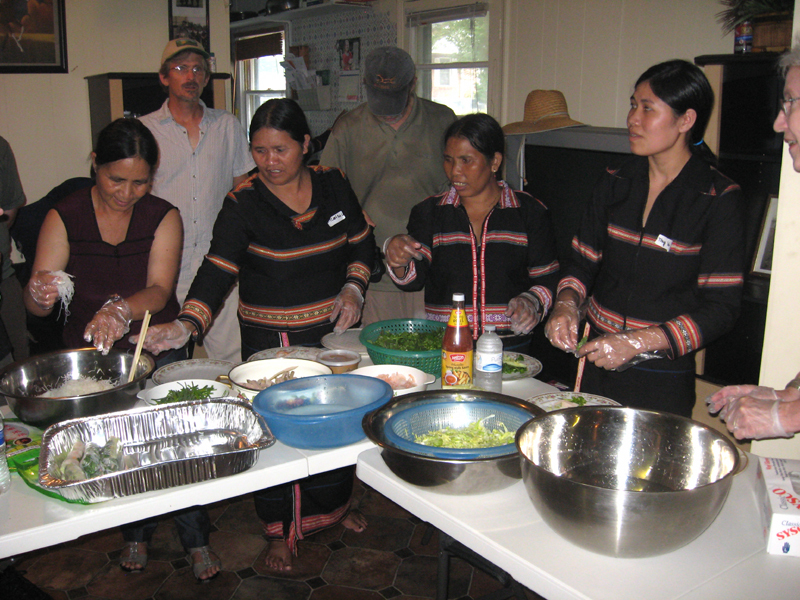 For example, foodies talk about authenticity; refugees talk about adaptation and survival. Members of the Women’s Learning Group want to start a different kind of dialog. They sell to (1) practice English (2) increase their social network and (3) earn themselves a few spending dollars. Some, like Phyen the weaver, produce goods with significant cultural value. When you buy an item from the Women’s Learning Group you promote a dialog of inclusion. See you at the Farmers Curb Market! Medium blanket with traditional hood. About 4 feet wide and 5.5 feet long, the hood allows for extra protection from the cold. Woven by Phyen in her apartment on a traditional backstrap loom. Baby carrying blanket, about 2 feet wide and 12 feet long. Montagnard women carry babies and children up to age 10. 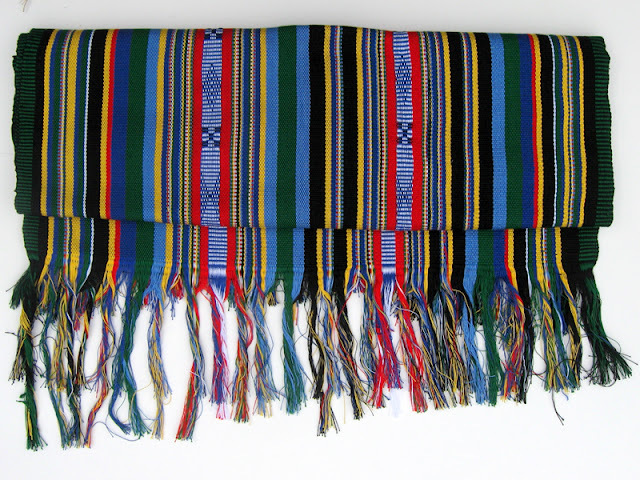 Woven by Phyen in her apartment on a traditional backstrap loom. Scarves knitted by H Blin. Head bands woven on a traditional backstrap loom by Ju. Lengths from 5.5 to 6 feet. 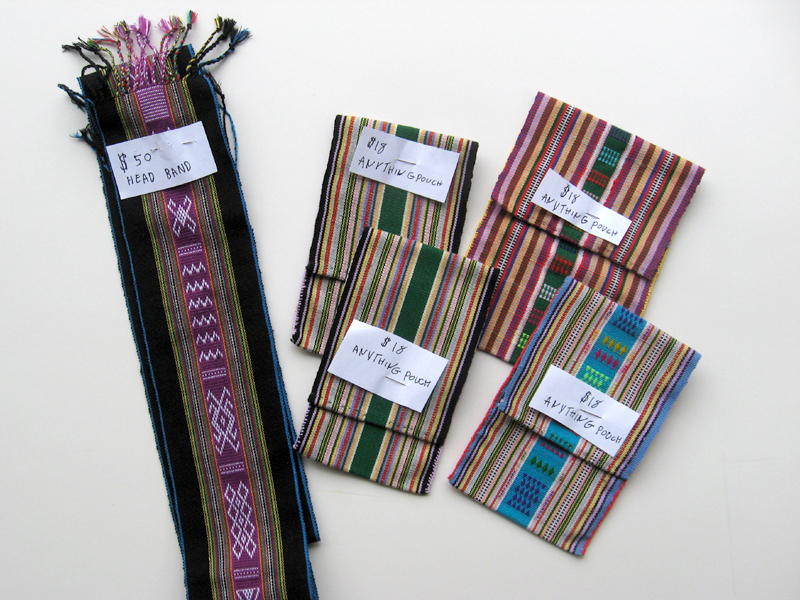 Head band and miscellaneous “anything’ pouches woven on a traditional backstrap loom by Ju. 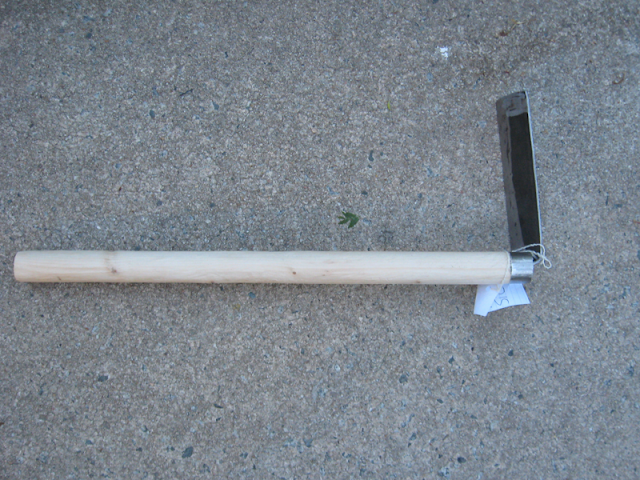 THE ROSEWOOD SPECIAL, traditional Asian farm and garden hoe used by Montagnards throughout the neighborhood. It is strong and easily handled by women gardeners. 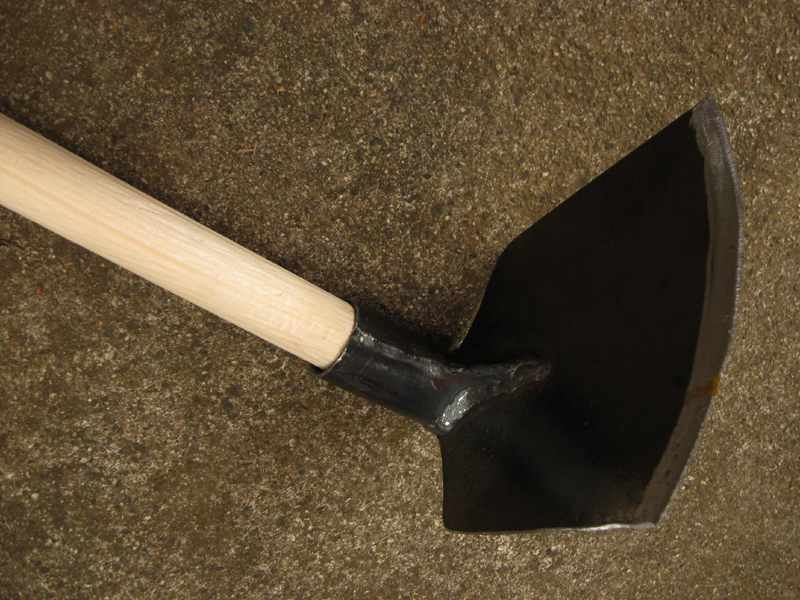 Unlike cheap American hoes bought at big box stores, this tool will quickly cut through stubborn roots and Carolina clay. It is also less stressful on the back than using a heavy mattock or pick. THE ROSEWOOD SICKLE AND WEEDER, used by Montagnards to cut rice, water spinach, remove pesky weeds, etc. 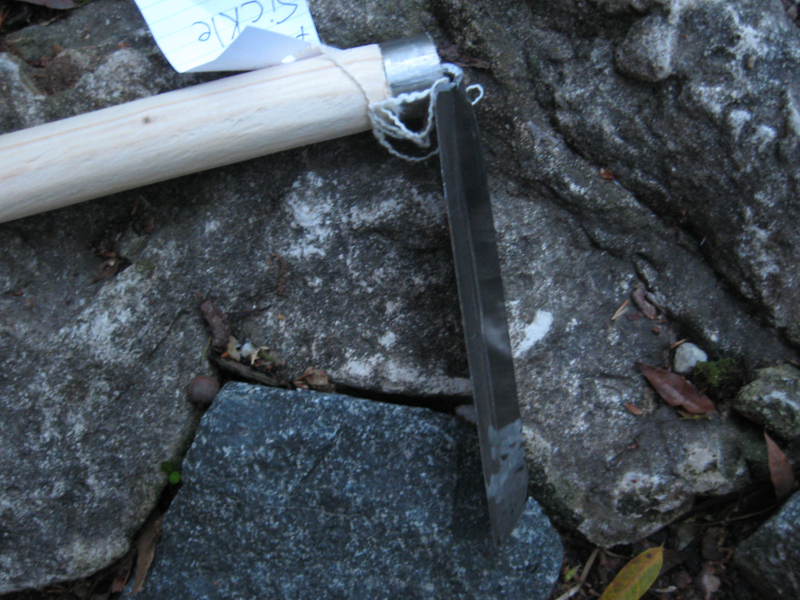 It is a very handy tool with two edged blades along the length and at the end. The neighborhood blacksmith also makes the same tool with a longer handle. 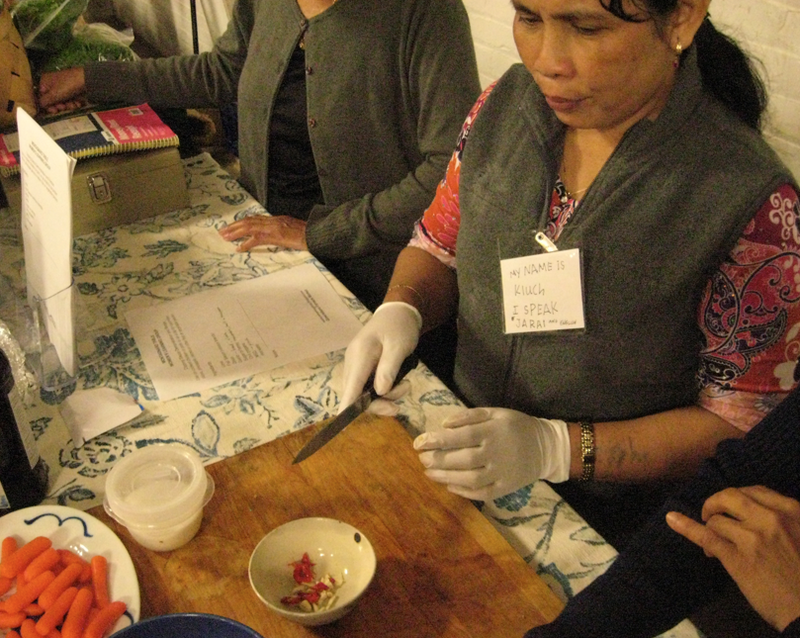 AT THE FARMERS CURB MARKET on Saturdays, a demonstration how to make dipping sauce and introduction to other Southeast Asian flavors.